All washdown hoses are flexible, lightweight, economical, durable, and safe. They come with your choice of end swivel adapter for nozzles and 3 piece adapters for mixing units. Hoses are available in lengths of 25′, 50′, 75′, and 100′ and can also be supplied in increments of 25′ up to 500′. SuperKlean offers a wide variety of hose constructions and materials to suit all your washdown needs. Please review the information listed below for additional specifications on hoses offered by SuperKlean or contact us for additional details regarding your specific needs. UBS-25-5/8 5/8" x 25' black washdown hose assembly. Wrapped finish. Neoprene cover. Chlorobutyl tube. Maximum working pressure 250 PSI. UBS-50-5/8 5/8" x 50' black washdown hose assembly. Wrapped finish. Neoprene cover. Chlorobutyl tube. Maximum working pressure 250 PSI. 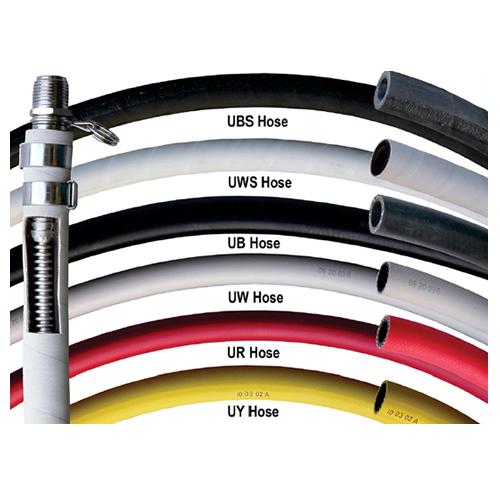 UBS-75-5/8 5/8" x 75' black washdown hose assembly. Wrapped finish. Neoprene cover. Chlorobutyl tube. Maximum working pressure 250 PSI. UBS-100-5/8 5/8" x 100' black washdown hose assembly. Wrapped finish. Neoprene cover. Chlorobutyl tube. Maximum working pressure 250 PSI. UWS-25-5/8 5/8" x 25' white washdown hose assembly. Wrapped finish. Hypalon cover. Chlorobutyl tube. Maximum working pressure 250 PSI. UWS-50-5/8 5/8" x 50' white washdown hose assembly. Wrapped finish. Hypalon cover. Chlorobutyl tube. Maximum working pressure 250 PSI. UWS-75-5/8 5/8" x 75' white washdown hose assembly. Wrapped finish. Hypalon cover. Chlorobutyl tube. Maximum working pressure 250 PSI. UWS-100-5/8 5/8" x 100' white washdown hose assembly. Wrapped finish. Hypalon cover. Chlorobutyl tube. Maximum working pressure 250 PSI. UB-25-3/4 3/4" x 25' black washdown hose assembly. Smooth finish. EPDM cover. EPDM tube. Maximum working pressure 250 PSI. UB-50-3/4 3/4" x 50' black washdown hose assembly. Smooth finish. EPDM cover. EPDM tube. Maximum working pressure 250 PSI. UB-75-3/4 3/4" x 75' black washdown hose assembly. Smooth finish. EPDM cover. EPDM tube. Maximum working pressure 250 PSI. UB-100-3/4 3/4" x 100' black washdown hose assembly. Smooth finish. EPDM cover. EPDM tube. Maximum working pressure 250 PSI. UW-25-3/4 3/4" x 25' white washdown hose assembly. Smooth finish. EPDM cover. EPDM tube. Maximum working pressure 250 PSI. UW-50-3/4 3/4" x 50' white washdown hose assembly. Smooth finish. EPDM cover. EPDM tube. Maximum working pressure 250 PSI. UW-75-3/4 3/4" x 75' white washdown hose assembly. Smooth finish. EPDM cover. EPDM tube. Maximum working pressure 250 PSI. UW-100-3/4 3/4" x 100' white washdown hose assembly. Smooth finish. EPDM cover. EPDM tube. Maximum working pressure 250 PSI. UR-25-3/4 3/4" x 25' red washdown hose assembly. Smooth finish. EPDM cover. EPDM tube. Maximum working pressure 250 PSI. UR-50-3/4 3/4" x 50' red washdown hose assembly. Smooth finish. EPDM cover. EPDM tube. Maximum working pressure 250 PSI. UR-75-3/4 3/4" x 75' red washdown hose assembly. Smooth finish. EPDM cover. EPDM tube. Maximum working pressure 250 PSI. UR-100-3/4 3/4" x 100' red washdown hose assembly. Smooth finish. EPDM cover. EPDM tube. Maximum working pressure 250 PSI. UY-25-3/4 3/4" x 25' yellow washdown hose assembly. Smooth finish. Nitrile cover. Nitrile tube. Maximum working pressure 400 PSI. UY-50-3/4 3/4" x 50' yellow washdown hose assembly. Smooth finish. Nitrile cover. Nitrile tube. Maximum working pressure 400 PSI. UY-75-3/4 3/4" x 75' yellow washdown hose assembly. Smooth finish. Nitrile cover. Nitrile tube. Maximum working pressure 400 PSI. UY-100-3/4 3/4" x 100' yellow washdown hose assembly. Smooth finish. Nitrile cover. Nitrile tube. Maximum working pressure 400 PSI.